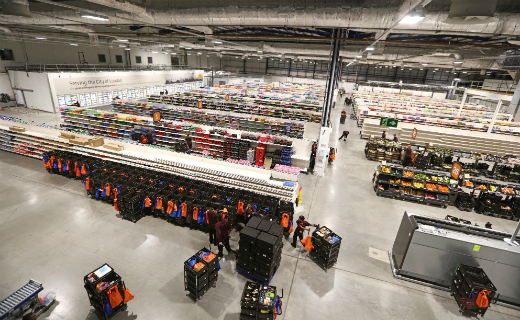 Sainsbury’s has opened a new 185,000 sq ft fulfilment centre in Bromley-by-Bow, East London. The new centre is designed to handle growing demand for its online groceries service in the capital – the supermarket retailer predicts demand will double in London over the next eight years. The site has the capacity to fulfil 25,000 customer orders every week. The new facility will include a ‘giant automated system’ with 1.5km of conveyor belts which are able to carry more than 7,000 crates. Almost 500 employees have been recruited at the site – Sainsbury’s has said this could reach another 430 by 2020. “Operating day and night, this state-of-the-art centre, with its cutting edge technology will enable us to handle exceptional volumes at high speed,” said Clodagh Moriarty, Sainsbury’s director of online. “The additional capacity provided by the centre means that, working with our 30 London stores which pick online orders, we’ll be able to keep up with demand for our service in London, which we expect to double over the next eight years. “Sainsbury’s launched its online grocery business in 1999 and, by 2013, sales had reached £1billion. Since then demand has continued to grow.